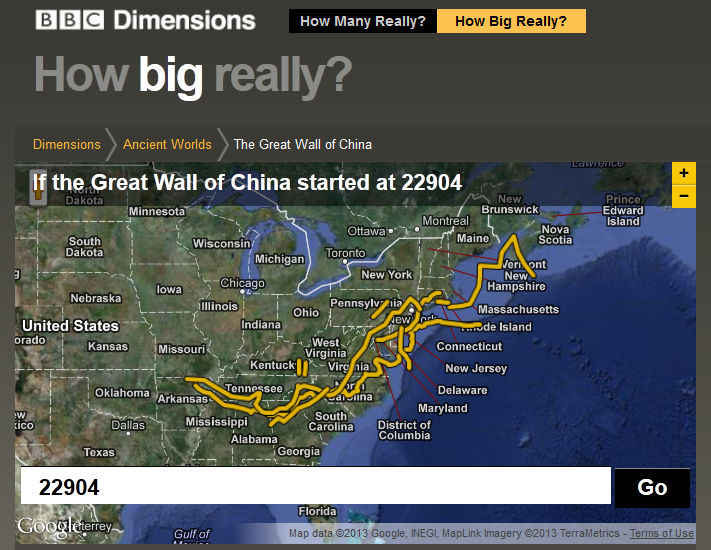 In geography, size matters. On maps, large always wins over small. We’re human. We’re wired to quickly spot patterns and make visual comparisons. See Tufte, Edward. Picture a map of your own state. 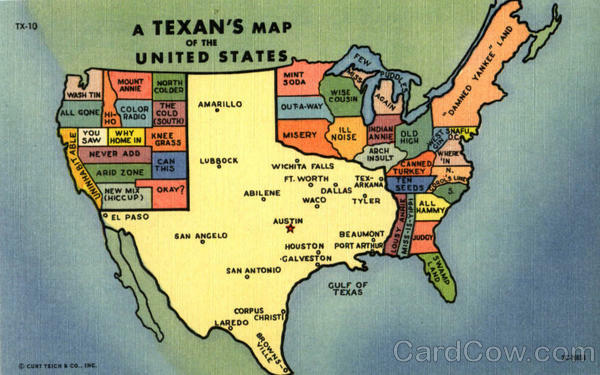 How does it compare in size to the states next door, the largest states, the smallest, or Texas? I recently joined with map-minded folks to build GeoTron 5000 to put the power of comparative geography and spatial literacy in hand. Choose two places and the GeoTron 5000 robot spins up two maps to show exactly how those places compare. So what’s going on behind the scenes in GeoTron 5000 to enable these mappy comparisons? GeoTron 5000 houses an international map library based primarily on Natural Earth, a fantastic public domain vector dataset. The Natural Earth maps were pre-processed using Quantum GIS geographic information systems software to present consistent comparisons of land area from California to Kyrgyzstan. International country lists and official land areas were harvested from the United Nations Statistics Division via their World Statistics Pocketbook and Demographic Yearbook. Domestic datasets are from the US Census. 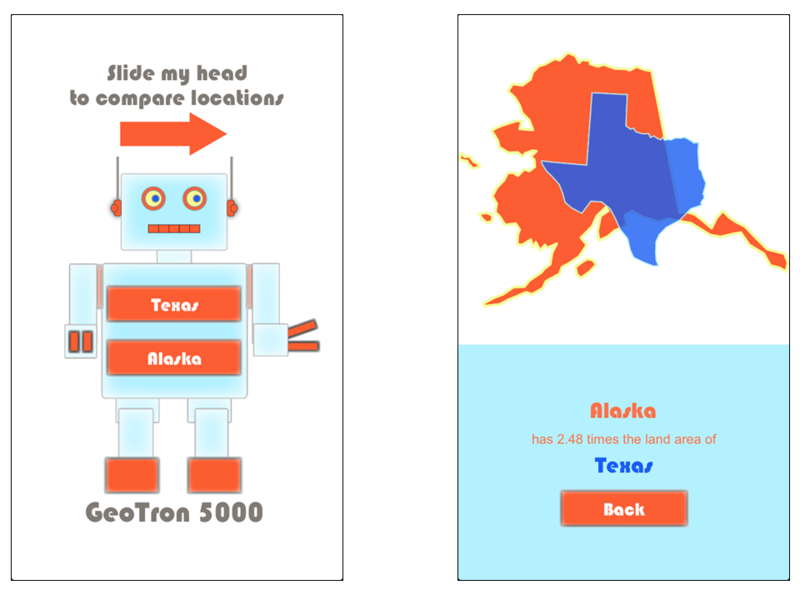 GeoTron 5000 is free at the Apple App Store and includes all 50 US States and the District of Columbia. Additional geographies outside the USA are available for comparison via in-app purchase. The app requires no cell service, no internet connection, and no international data plan when traveling. Visualizing comparative size and shape requires skill in spatial thinking. Packing a suitcase, parking a car, finding a restaurant, finding your car when leaving the restaurant…all involve visualizing spatial relationships based on size, distance, shape, and changing points of reference. Artsy infographics overlay the world on Africa and popular television explores Mercator’s map distortions. We’re all thinking spatially every day. Universities host spatial studies centers , organize spatial studies conferences, and offer graduate level training in spatial literacy. And spatial literacy is a topic of growing academic focus beyond the higher ed classroom. Kids love maps. Using maps to illustrate comparative size promotes spatial thinking at an early age. Scaled maps for geographic comparison using How Big Really or GeoTron 5000 inform spatial reasoning by answering the key question: compared to what? Cite this post: Kelly Johnston. “Size Matters”. Published March 11, 2013. https://scholarslab.lib.virginia.edu/blog/size-matters/. Accessed on .